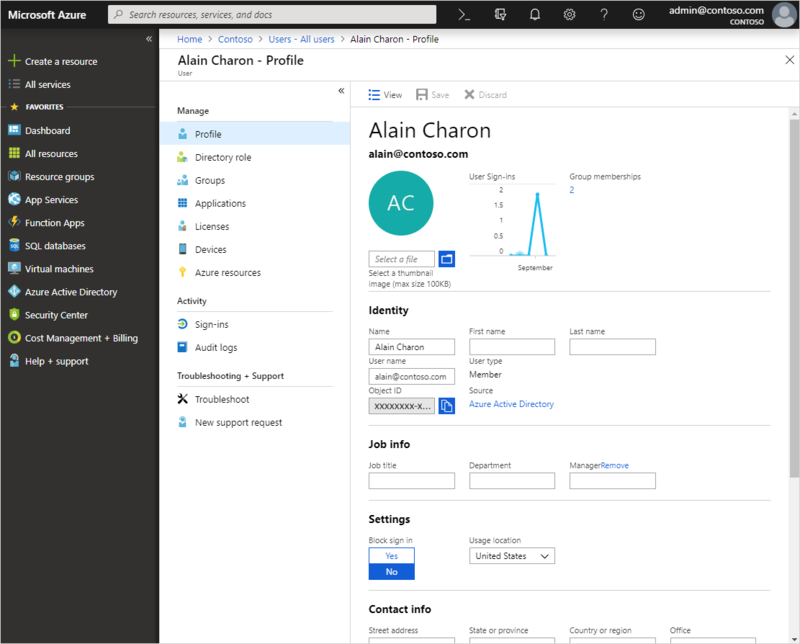 Add user profile information, including a profile picture, job-specific information, and some settings using Azure Active Directory (Azure AD). For more information about adding new users, see How to add or delete users in Azure Active Directory. As you'll see, there's more information available in a user's profile than what you're able to add during the user's creation. All this additional information is optional and can be added as needed by your organization. Sign in to the Azure portal as a User administrator for the organization. Select Azure Active Directory, select Users, and then select a user. For example, Alain Charon. The Alain Charon - Profile page appears. Select Edit to optionally add or update the information included in each of the available sections. Profile picture. Select a thumbnail image for the user's account. This picture appears in Azure Active Directory and on the user's personal pages, such as the myapps.microsoft.com page. Job info. Add any job-related information, such as the user's job title, department, or manager. Settings. Decide whether the user can sign in to Azure Active Directory tenant. You can also specify the user's global location. Contact info. Add any relevant contact information for the user. For example, a street address or a mobile phone number. Authentication contact info. Verify this information to make sure there's an active phone number and email address for the user. This information is used by Azure Active Directory to make sure the user is really the user during sign-in. Authentication contact info can be updated only by a global administrator. All your changes are saved for the user. You must use Windows Server Active Directory to update the identity, contact info, or job info for users whose source of authority is Windows Server Active Directory. After you complete your update, you must wait for the next synchronization cycle to complete before you'll see the changes. Or you can perform other user management tasks, such as assigning delegates, using policies, and sharing user accounts. For more information about other available actions, see Azure Active Directory user management documentation.